This is now the sixth year I’m making predictions for the Academy Awards, and unlike years past I’m getting these out more than just a few hours before the ceremony starts! 2018 was an off year for me in terms of getting to the theater and see a lot of the nominees. 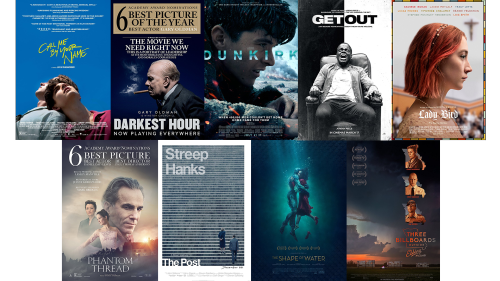 My goal every year is to see all the Best Picture nominees, a feat I was able to accomplish three times (for the 85th, 87th, and 88th Academy Awards — and only one or two away the other years). Unfortunately, I only saw four of the nine nominees this year (I’m hoping to get to the theater this weekend to see one or two more, and will update this post if I do, but my predictions are locked). Of all the years to not see most of the nominees, I chose a year when there were a lot of good films to choose from. As I’ll mention in a few of my explanations below about why I chose my “Most Deserving” and “Most Likely” picks, I’m really disappointed in myself for not having seen more. I’ve only heard outstanding things about Get Out, Coco, and Baby Driver (my semi-dark horse pick for Best Film Editing) among others. Lady Bird was less universally praised but still phenomenal and deserving of its nominations from what I’ve heard. Every year around Oscar time I always get back into the swing of things, watching and reviewing a lot of movies. It is my way of prepping for the Oscars and always like a reset button for me. It wasn’t until I saw Three Billboards and The Post last weekend did I realize that woah, the Oscars are in a week! They really snuck up on me this year which is why I’m scrambling a bit. I make a promise every year to use this as an opportunity to really re-commit myself to this blog and these reviews, and hopefully I keep that commitment more than I have in years past. It’ll never get to the level I was in Year 1 where I met my goal of watching 365 films in 365 days, but hopefully it is more than the meager 15 films I reviewed in 2017. Why: A lot of people are predicting The Shape of Water to go home with the big win. It is nominated down-ballot for a lot of the technical awards and is posed to bring many of them home. In many ways, The Shape of Water is the easy, straightforward, and probably smart pick for everyone filling out ballots at home — the probabilities are in this film’s favor. But I’m choosing to go with a bit of an underdog here for a few reasons. First, Best Picture is voted on using a preferential ballot as many people are quick to mention, and can be seen as the reason Moonlight and Spotlight pulled out semi-underdog wins the past two years. Second, as other, smarter, people have also noted, while winning Best Director was often a good predictor of the Best Picture winner, the last few years have split these awards, opening up greater possibilities. So, while I unfortunately haven’t seen Get Out, it will be my risky choice for my Most Likely nominee this year. As I said in my review for The Shape of Water, it was a good film but wasn’t my cup of tea. I understand the hype about it, but, similar to my opinions about Silver Linings Playbook back in 2013, I’m kind of rooting for the anti-The Shape of Water angle as my form of mini-protest; nothing personal, I just think there’s other, better, choices — albeit, ones I haven’t seen because I missed a lot this year. I’ll be very curious to see who ends up walking home with the trophy. Is it the expected favorite, or will the ballot voting rules wash up more of an underdog pick. Three Billboards would be a good second choice pick, and more conventional one than Get Out for the underdog vote, but I’m sticking with my gut and choosing the February 2017 release (!) of Get Out (and then hopefully get a chance to watch it soon after). Why: Far and away my favorite aspect of Dunkirk was its score. It is memorable, propulsive, and core piece of the film’s identity. I even have several tracks saved on my Spotify — great for work to get one of the songs to turn up on shuffle. Hans Zimmer’s music does always sound of the same ilk, but his past several scores have always stood out to me for different reasons and Interstellar was my choice for the 87th Academy Awards. In an odd coincidence, just like in 2015, it appears that Alexandre Desplat will once again walk away with the Oscar for his work on The Shape of Water. Why: The consensus seems to be split between Baby Driver and Dunkirk. Dunkirk was the favorite by count of the sites I track when making these predictions, and war films often win this category. Baby Driver is my pick for its recent win at the BAFTAs, even though it may be a slight underdog odds-wise. There are a lot of films I wish I’d seen this year, and Baby Driver is probably at the top of that list. Trailer editing is completely separate from film editing, but based on the trailer alone I’m going to give this the win. Dunkirk was phenomenal and is the most deserving of the films I saw, but even so, there were a few story-related problems that I would say are a cause of editing — everything doesn’t need to always be a time-altered mess of the mind Christopher Nolan.